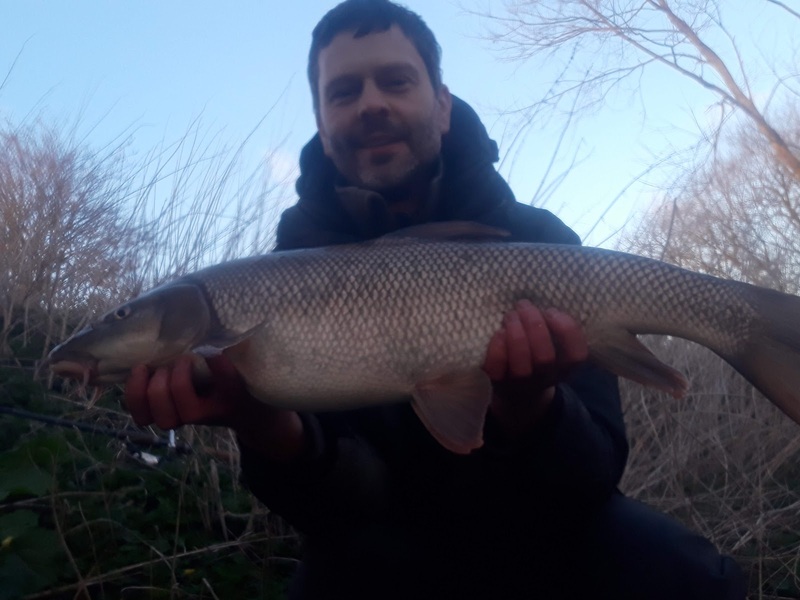 After my pike adventures of the winter, I was keen to finish off the season with a few barbel. The weather was relatively kind too. Temperatures were reasonably mild and most rivers had extra water. The only issue was that the levels had been up and down on an almost daily basis so stability was certainly lacking. With the last weekend of the river season upon us, I headed to a stretch of the middle Severn. This stretch had been kind in the past, especially when carrying extra water so I was confident of a bite or two. A rather busy car park greeted my arrival. Hardly surprising but a little disappointing nevertheless. It forced me upstream instead of my usual ventures downstream. I bumped into a couple of chaps who had blanked the previous day. It was similar news among the other anglers there but I found myself a likely looking swim and gave it a couple of hours. It was an uneventful few hours too without so much as a tap. I'd have liked to have roamed the stretch but it was too busy for that. By now it was lunchtime so I decided that given no one was catching it was time for a different stretch. Fifteen minutes later and I was in a new swim. Again fishing was slow despite what looked to be great conditions. A change to a pellet hookbait accompanied with a PVA bag finally saw a bite and a barbel was on. 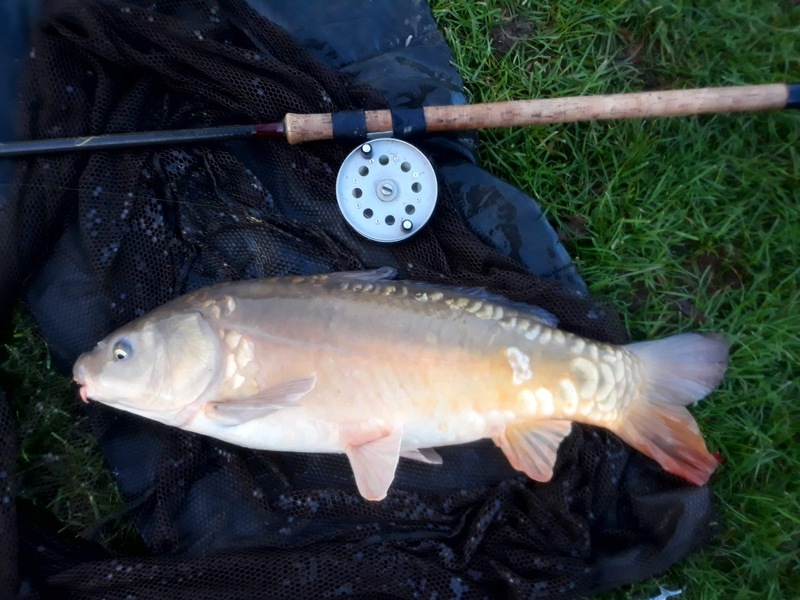 A lovely plump fish of 9lb 2oz was the result. I hoped it would prove to be a catalyst for a few but it was to be the only bite of the day. 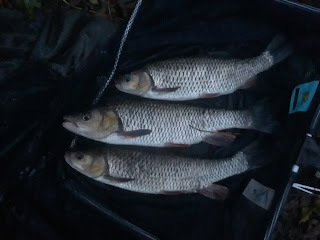 Two short sessions on the Warks Avon after work completed the season for me. The first was on a rising river that had yet to colour up. 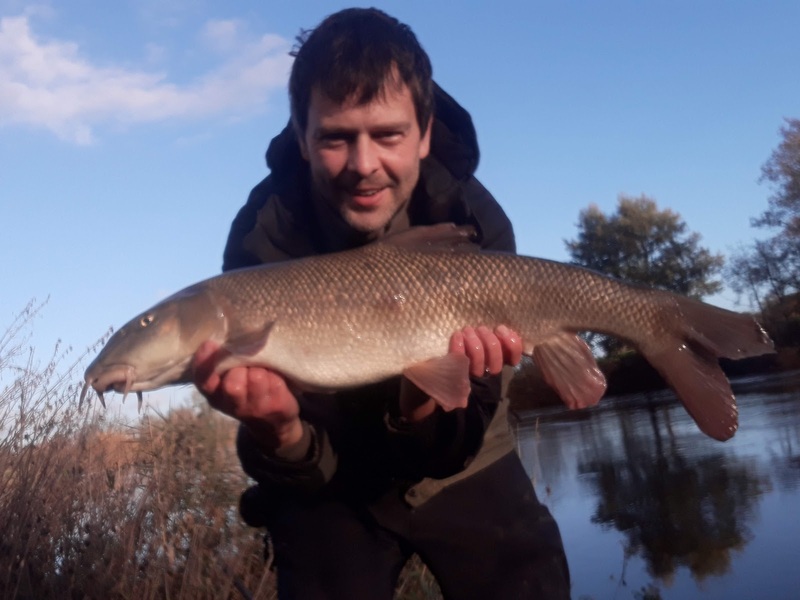 Within 45 minutes a barbel was landed at 8lb 7oz falling to pellet presented upstream towards the far bank tree cover. The river continued to rise rapidly and by 7pm I called it a day with no more action seen. The final day of the season saw me back on the river. It was highly coloured but dropping. A few fish had come out during the day to other anglers so I was mildly optimistic. That optimism soon dissipated as my baits were ignored. It looked for all intents and purposes that the season was going to end in a disappointing blank. The session was drawing to a close so I began to pack up. The first rod came in and was dismantled when out of the blue the bait on the remaining rod was picked up. My third barbel of the week was landed. Although very welcome, it wasn't huge probably going between 6 and 7lb and with it my 2018-19 season was over. Much has been discussed regarding the close season although I for one welcome the break. I may be in the minority these days but a break makes the heart grow fonder and it will allow me venture to pastures new. 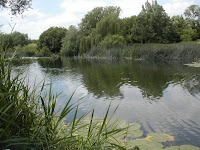 While the weather is still on the cool side I will target perch and then switch to tench as the water begins to warm. By then my thoughts will already be wandering towards the 16th June. 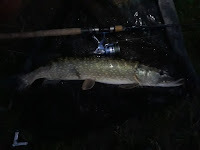 The last time I blogged, I was in the middle of an enjoyable pike fad. Having already landed some nice river doubles my appetite had yet to be sated and I was still on the hunt for more. Several sessions saw me catch on each of them although the fish were small. One Sunday afternoon session was particularly slow. Sat in my banker swim, the light began to signal the end of another February day. It looked like a blank was looming. I drew the float back towards me, partly as the light was now departing making it difficult to make it out on the water's surface. In its new position it sat nicely in between the reflection of some trees. It was then that it moved ever so slightly into the darker part of the reflection. It was a matter of inches but it had definitely moved. Was it the current? I was unsure. If it was a bite then it was very subtle. I held the braid between my fingers and felt for movement. A slight tug registered but again very subtle. If this was indeed a fish then it had barely moved upon picking up the bait. Another slight pull on the braid was enough to see me wind down and strike and indeed a fish was on. It felt good. No alarming runs but a decent force at the other end nevertheless. By the time it made the net it was pretty much dark. 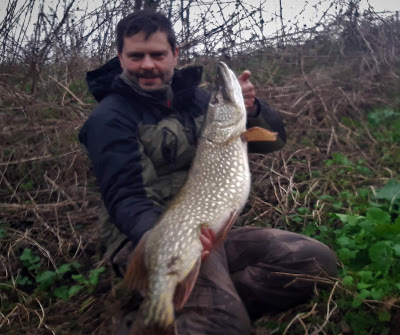 However, I could see enough to be sure another great river pike had been landed. It also was a great learning experience, showing me how little a pike can move a float despite picking up the bait fully. 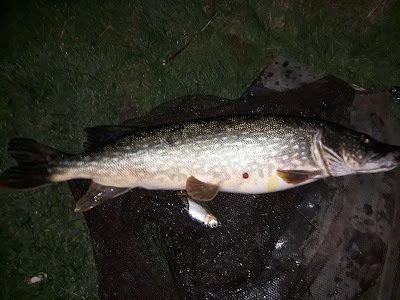 I had another smaller pike do the same more recently so it really does pay to give your full attention. With March now here and the river levels fluctuating almost daily it has almost certainly signaled the end of my pike campaign for this year. 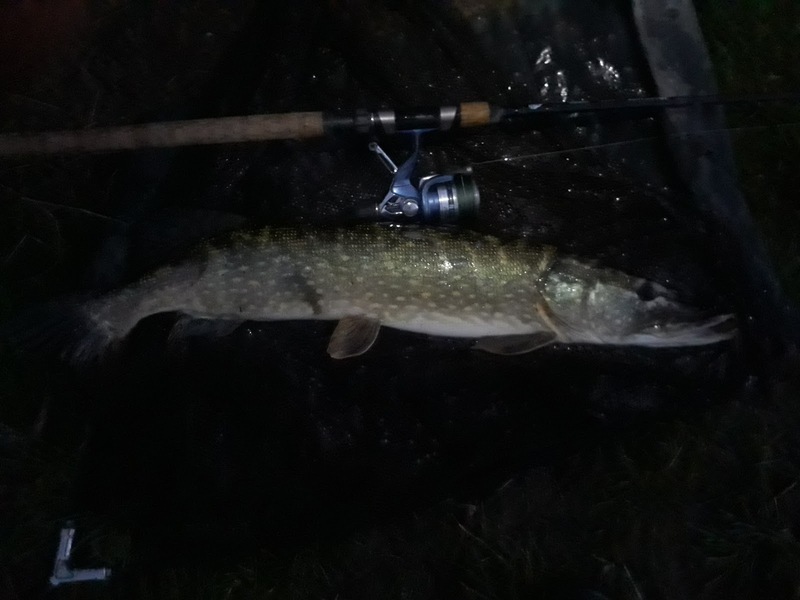 Three very nice pike have been landed with plenty of smaller ones keeping me busy on the slower days. 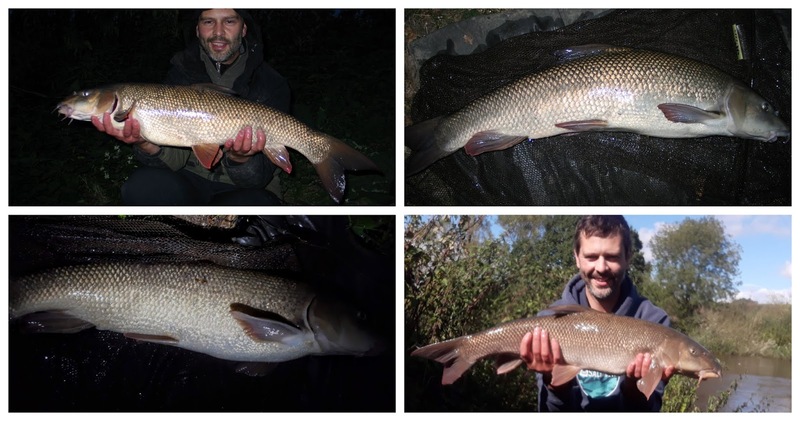 With the season almost over I shall now look to finish with a barbel or two. Recent weather finally brought some rainfall and with it the hope that the rivers would finally give us something to get excited about. 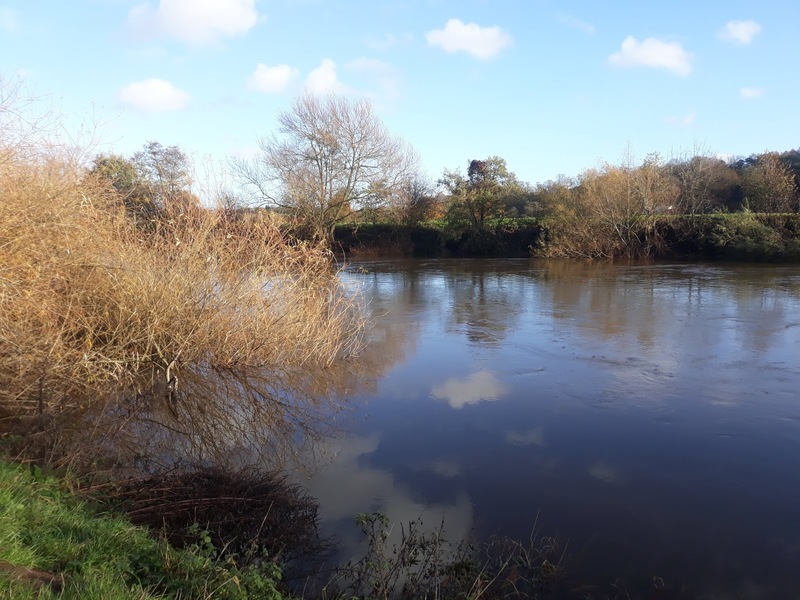 While this week's weather has seen a cold blast hit UK shores, the last few weeks have been very mild with most rivers returning temperatures of about 10°C. However this had been largely coupled with low clear water so any rainfall would be gladly welcomed. With the temperatures so high for November it seemed silly not to have a go for barbel. The weather is fickle at this time of year and it could be weeks, even months before another opportunity this good arose. My local Warwickshire Avon saw no change to its levels, well maybe a few inches but nothing to set the pulses racing. The Severn had risen a little but again it didn't really fill me with confidence. The Wye however looked to have about 4ft on and was starting to drop. It was what I was looking for and my mind was made up pretty quickly. I arrived just after lunch to find the stretch empty. Just the way I like it. I had not fished this stretch before in such conditions so a bit of roving was the order of the day and with no one else there it meant I was free to do what I liked. I walked upstream, eyeing a few likely looking spots behind trees. It was this type of swim that I dropped into first. With the main current a torrent I hoped the fish would be sheltering behind these obstructions. I had only brought one rod and that was tackled with a straight lead to a size 2 hook baited with meat. I aimed to give each swim up to 30-40 minutes. In these conditions a fish ought to show relatively quickly if they are indeed present. Within minutes of settling down the heavens opened. The forecast has not mentioned rain so without an umbrella I simply had to sit it out. Soon after it turned to a sharp hail storm. It was not a great start but the sun returned and gave me just enough heat to attempt to dry off a little. The first two swims produced nothing other than one sharp jag on the rod tip. I dropped further downstream to an area that looked a whole lot more promising. 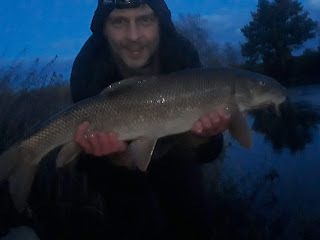 A smooth looking glide screamed barbel so my bait was cast just my side of the crease. 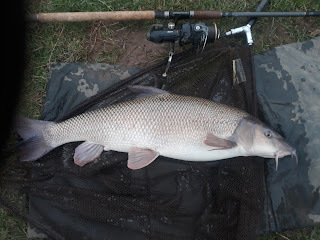 I didn't have to wait too long before a tap turned into a wrap around and the first barbel of the day was hooked. It put up a decent scrap and a fish of just over 8lb was my reward. point. 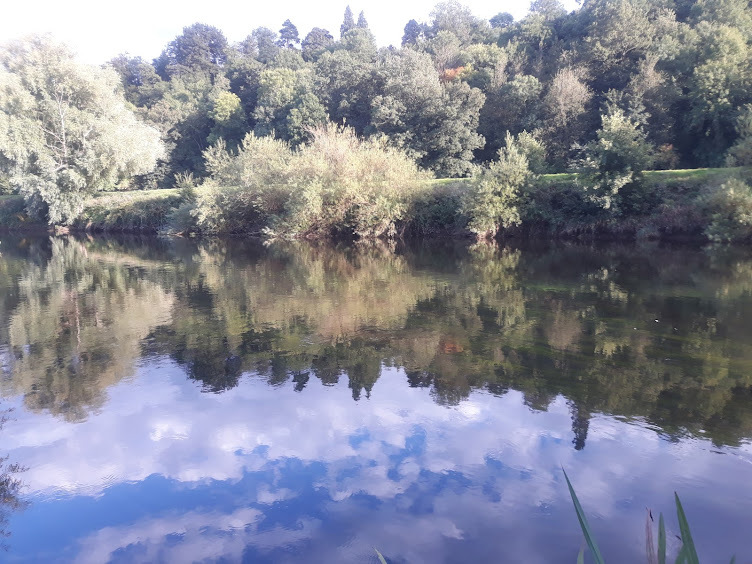 The next hour or more was pretty quiet fishing wise but the Wye Valley is as good as anywhere to spend an autumn afternoon. With stunning scenery, buzzards soaring overhead and the chance that any moment could signal the arrival of a barbel the afternoon flew by. The sun started to set and with it daytime began to lose its grasp. This time of the day is always synonymous with a barbel bite and today was to be no different. 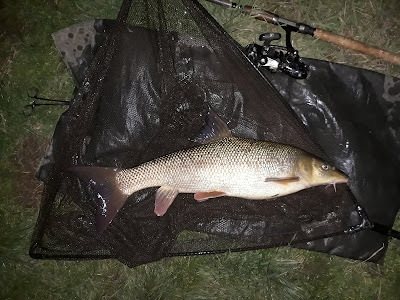 A positive bite saw me connected with another barbel that put up a much more stubborn resistance than the first fish. Another fine looking barbel was landed with this one going 9lb 9oz. It was a fitting way to end an enjoyable afternoon on the river Wye. If you find yourself here then please look around the rest of the site. Comments are always welcomed. The end of October coincided with high pressure meaning cold nights and bright days. Despite having the week off, I still ended up having to fish on one of the brightest of them. 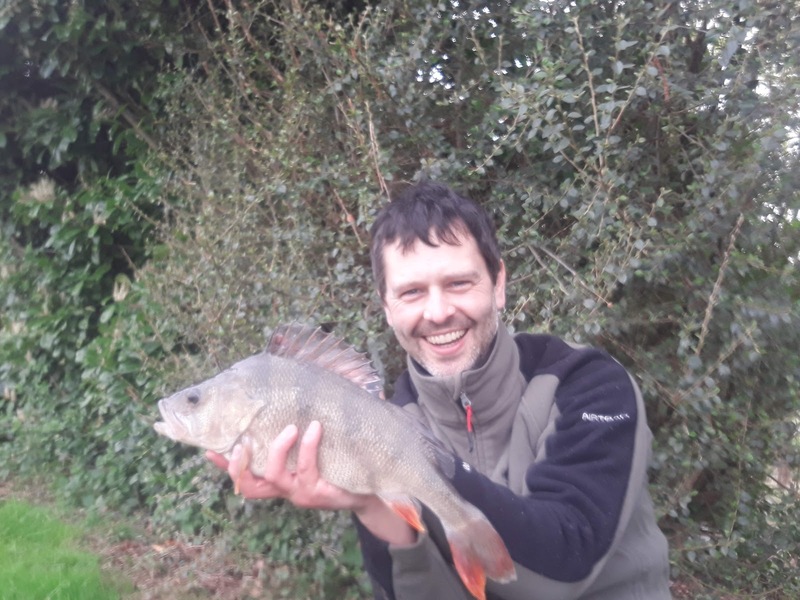 I had decided to target some decent perch and as we all know, bright sunshine is not the perch anglers favourite condition. Arriving at a stillwater that had been kind to me in the past, I tackled up with a ledger set up with prawn and a float set up with worm. Regular feeding soon had the swim filled with the resident roach and skimmers. 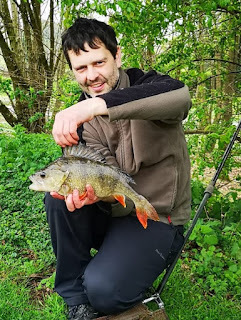 With perch sport slow, I changed to a maggot hookbait and enjoyed some nice roach. As the afternoon wore on and the sun began to dip behind the trees on the far side of the lake. I was left in the shade and the temperature dipped sharply as another frosty night loomed. Although chilly, I knew the low light would give me a better chance of a perch so it was all systems go with prawn and worm baits cast into prime position. The waiting game began. 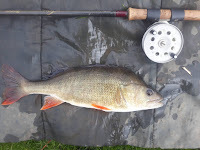 Regular feeding kept the prey fish in the area and I just had to hope the big perch would turn up at some stage. Some of the resident day ticket anglers fishing for carp started to depart. It was now as the lake became quiet that I noticed something a little different. The smaller fish in my swim seemed to have disappeared. Had the perch moved in and caused them anxiety? I recast my ledger rig baited with a prawn. I then placed the rod into the rest. I was still holding the line as I set about clipping on the bobbin but there was no need. A sharp tug registered. Then another. I struck and a decent fish was on. I quickly decided it had to be a perch so I just had to ensure it stayed on. Every time a good perch surfaces it never fails to be a breathtaking sight. They have been described as the biggest fish of all and there's no doubting they make for impressive viewing. 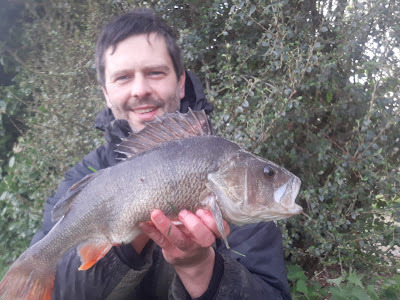 The fish was safely netted and although it wasn't going to threaten the 3 pounders I'd had from the venue previously it was certainly over 2lb. The scales confirmed this at 2lb 4oz. I hoped this would signal a flurry of activity and another perch around the pound mark fell to the worm. 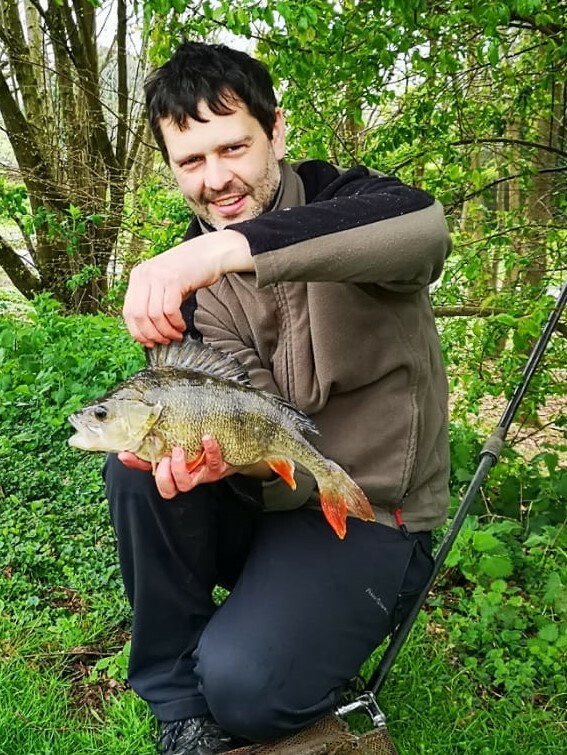 Another positive bite on the worm put a huge bend on the rod and signaled one of the resident carp had been hooked. Whilst good fun on a through action rod and centrepin its marauding around the swim put an end to end hopes of anymore perch. Soon enough the light had gone and the session had ended. A few days later I was on the Warwickshire Avon. The river had been low and clear for what seems an eternity. With the temperature dropping it was a toss up between pike or chub with the latter winning. Tactics were going to be simple with trotted bread flake the order of the day. By the time I'd faffed about it had gone 3pm by the time I'd thrown some mashed bread into the head of my chosen swim. With the nights drawing in I probably only had about 90 minutes to make this work. One thing in my favour was the fact the Avon has a great head of chub. Most are in the 3-4lb class but they are great sport especially on fair tackle. A piece of flake was presented on a size 12 hook to a 7lb hooklength. My first cast was made and the float started its journey through the swim. Half way down and the float sunk from view. 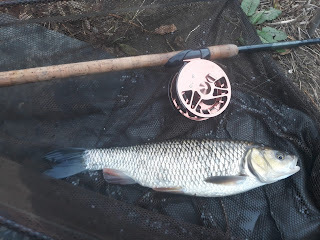 My strike was met with solid resistance as the first chub of the day made a bid for the nearside cover. It was a great start. The next cast saw a repeat with the float burying and another good chub hooked. This was beginning to look like a super session in the making. It was maybe the next run down that another fish was hooked. However this one had a bit more intent about and took off across the river towards the far bank trees. I was unable to tame it and the hooklength parted. I have no idea whether this was an over energetic chub or whether I had connected with a barbel. I will never know. 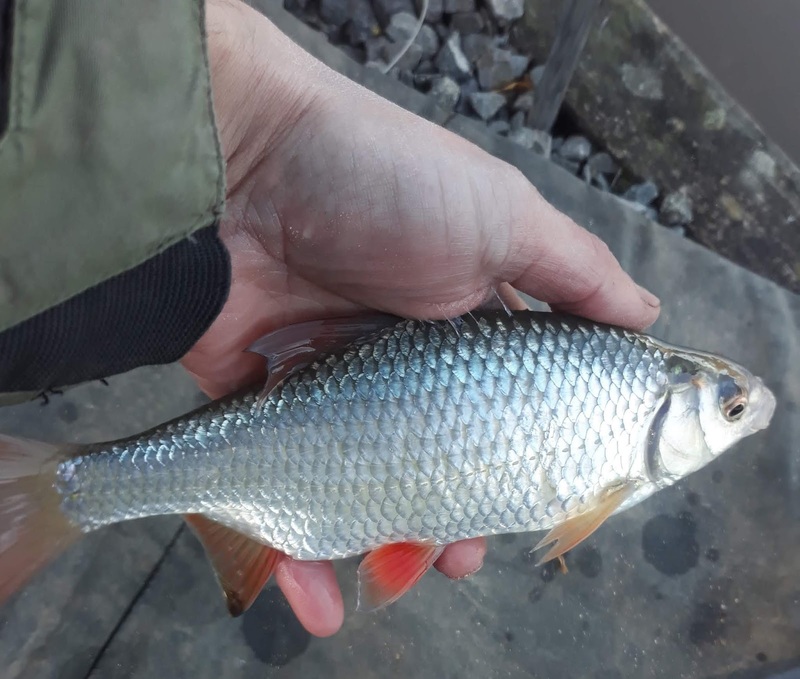 Another chub showed meaning I had managed three chub and a lost fish within the first 6 or so casts. It was then that the chub vanished almost as quickly as they had been caught. I persevered hoping some more mashed bread would entice them back upstream. Had I not started so late in the day I would have moved and most likely added some more fish but with light fading it was time to call it day. It had been an enjoyable hour or so and something I must do again soon.